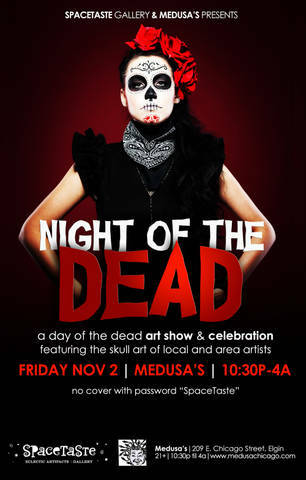 US Halloween meets Mexico’s Day of the Dead via Spacetaste Gallery! 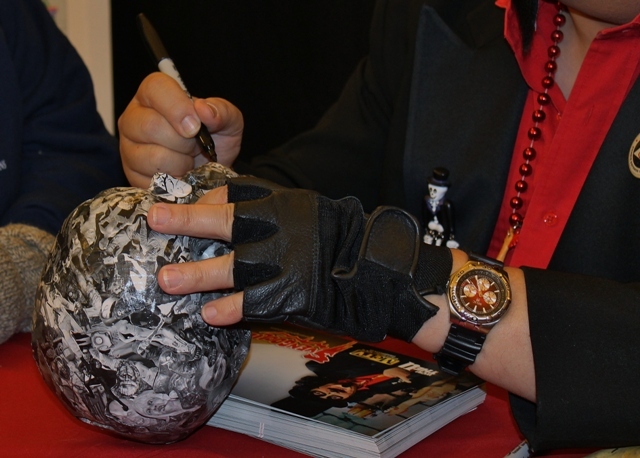 One of these perks is getting to see the diversity and creativity of his fans. 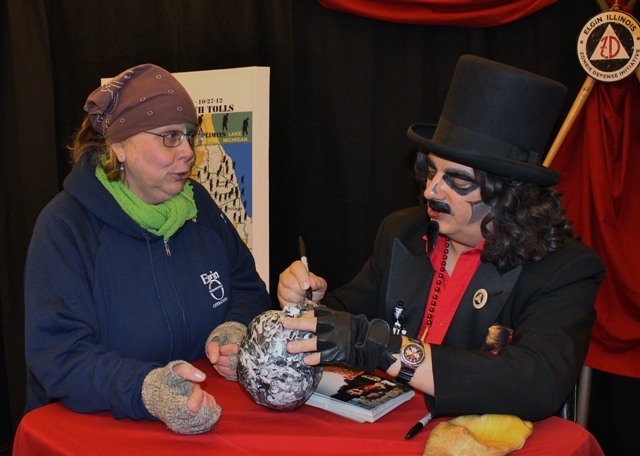 Last Saturday I attended the “Nightmare on Chicago Street” in Elgin, Illinois which I will absolutely be delving into more in coming posts. In the essence of time, however, I wanted to mention a special event (taking place THIS Friday November 2nd) that I learned about via one of Sven’s fans. Let’s face it, there are few horror fans that aren’t crazy about “skulls.” The sinister visage that lies just beneath the very faces many of us work so hard at making presentable has always held its fascination. We’ve seen them in horror movies and, if you’re a Sven fan, even wearing a mustache and chiding the host. 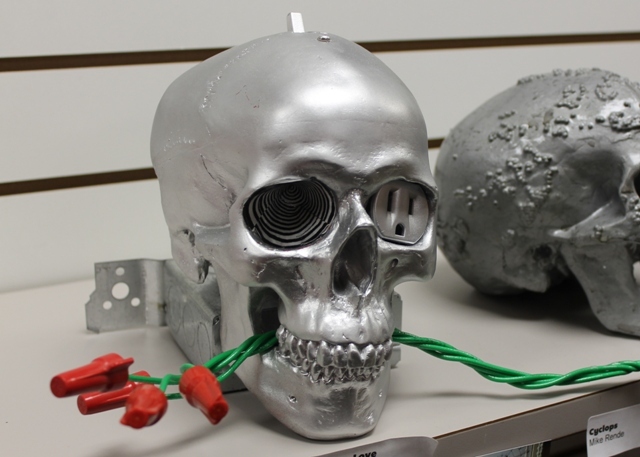 But you’ve never seen them like the ones at “SPaCeTaSTe GaLLeRY” in downtown Elgin. 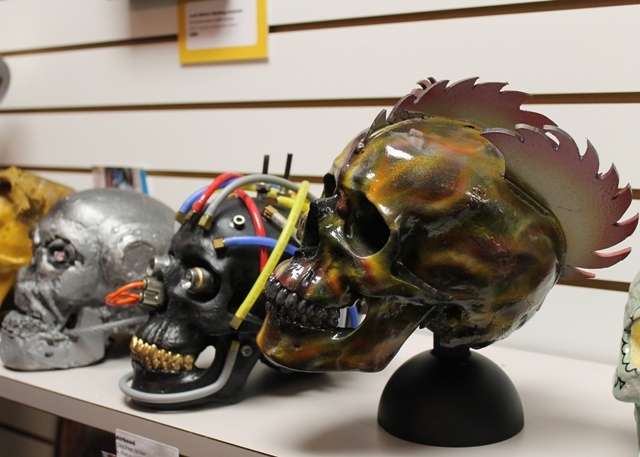 Prior, to Sven’s appearance, I went into the shop with my friends and was blown away by some of the amazing decorative skulls on display. 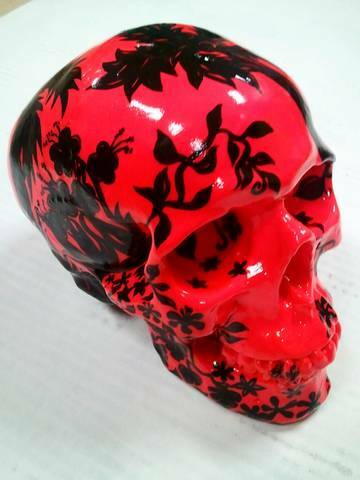 Vivid colors, abstract designs and themes made no two skulls the same. The store was packed with ghouls at the time and we weren’t able to stay long which was a shame because this is one store where you could easily spend hours checking out all the amazing creations. 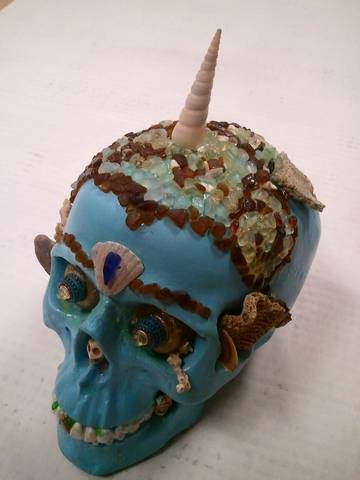 I had the privilege of speaking to Glenna after wards and she explained that this skull would be auctioned off along with nine others this Friday. Some of the money will go towards “Friends of the Lord’s Park Bison Initiative.” The event takes place at the Elgin Public Museum (Illinois’ oldest building) and runs from 7-9pm (the auction is at 8pm). Check out the press release below for more details. If you’re a winner, email a shot of yourself holding your winning skull at terrordaves@ymail.com and we’ll happily post your picture! 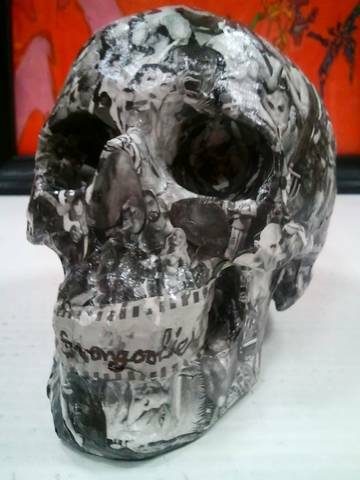 Following up 2011’s successful “Skulloween” campaign, where Spacetaste sold Artskulls – resin human skull banks that were re-imagined and repainted by local and area artists with proceeds going to the Friends of the Lord’s Park Bison Fencing Initiative, “Skulloween 2” continues supporting one of Elgin’s legacy gifts, nestled in Lord’s Park. Founded in 1904, the Elgin Public Museum enjoys the status of being Illinois’ oldest building, originally built as a museum and still operating that way today. Funded partially by the City of the Elgin, grants and a donor base, EPM works constantly to fundraise to support its year round programs. Proceeds from the sales will be split with the Museum to help underwrite the costs of new exhibits. 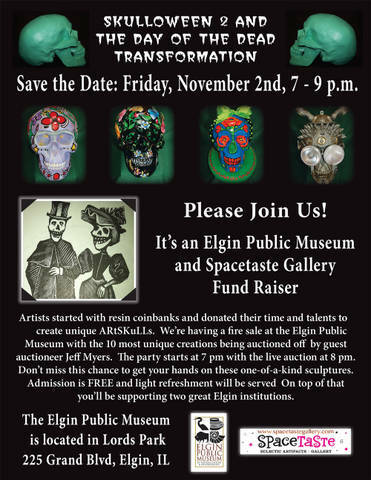 More history on Elgin’s oldest treasure can be found at http://www.elginpublicmuseum.org. 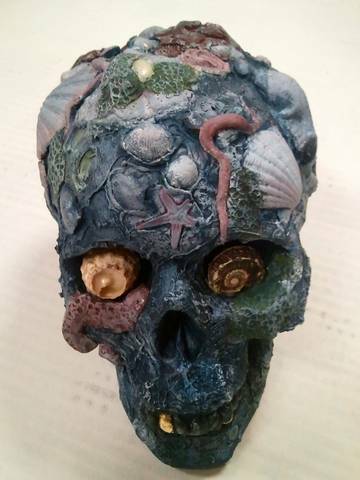 The skulls (donated by Elgin resident John LaFleur, whose family enjoys both the Park and the Museum), were distributed to artists in August. 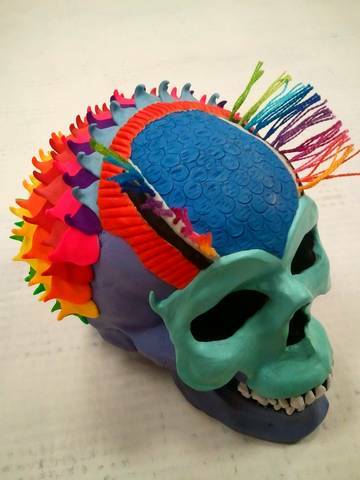 They have been painted, cut apart, accented and adorned in truly imaginative ways (think Cows on Parade…but with skulls!) With names like “Goggles”, “Flash”, “Snake Eyes”, you get the picture. They are now on sale at the Gallery with a limited number also at the Museum. 10 of the favorites have been reserved and selected for a live auction, hosted by local Chanel 17 Elgin Today host, Jeff Myers who has graciously volunteered to be the auctioneer on November 2nd. 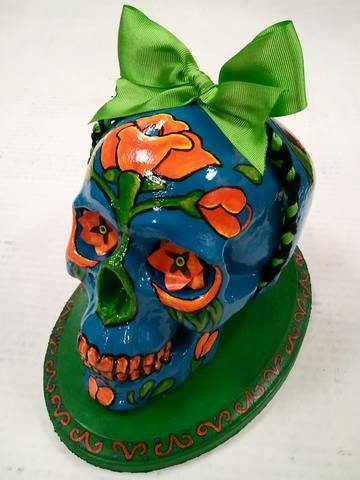 The Day of the Dead themed event runs from 7 to 9 with the live auction starting at 8. Featuring an ofrenda, or alter that honors loved ones past, created by Trinidad Rodriquez and her daughter. Admission is free and light refreshments will be served. 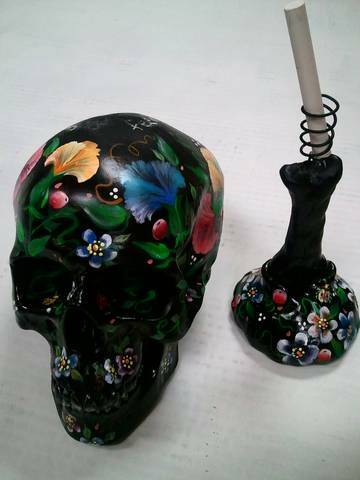 Contact Tim Solarz of Spacetaste (spacetaste@gmail.com) or Sara Russell of EPM (russell_epm@cityofelgin.org, 847-741-6655) for further information and follow the Gallery and Museum on Facebook for exciting pictures posted daily of artists and their Artskulls. This entry was posted in Halloween, Masks, Models, & Props! and tagged HALLOWEEN, Mexico Day of the Dead, Nightmare on Chicago Street, Skulloween, Skulls, Spacetaste Gallery, Svengoolie. Bookmark the permalink. 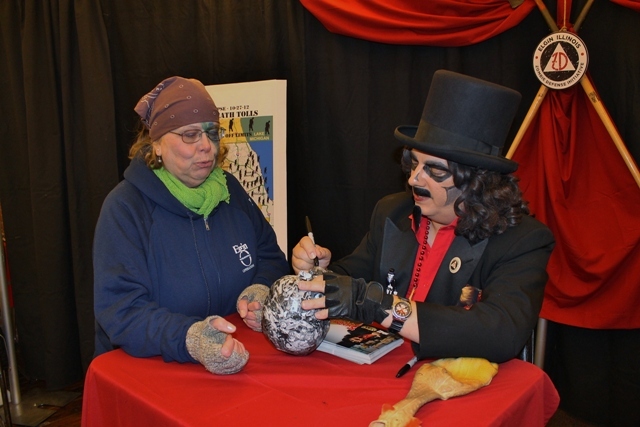 ← A NEW Coffin for Horror Host, Svengoolie!